Cheeselovers Day is only a few days away. What better way to celebrate than with a pairing of 4 wines and 4 cheeses! We did the tasting for this entry back in the summer during our visit to Lake Erie Wine Country. One of our favorite things about wine and cheese in this area is the Reverie Creamery and Market in Mayville, NY. They have such a great selection of not only their own cheeses but many of the big hitters too. We’ve made a trip out to this shop a few times along with our annual wine tasting voyage around the lake. Actually the tradition now includes the wine tastings, the visit to the cheese shop, and a group tasting with family. 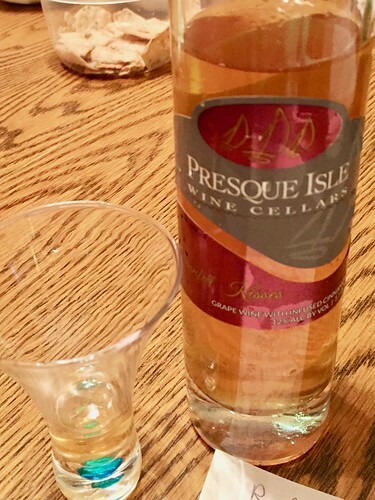 This year the winery visits included Presque Isle Wine Cellars, and Penn Shore Winery and Vineyards, http://wineandcheesefriday.com/wine-tasting-in-pennsylvania-2018/. Find the wines that we purchased below in this tasting. When choosing the cheeses, I got a little adventurous. This is the third year of tasting with Kathy, Gale, Diane, Brian, Michelle, Neil and I. I’ve got a better idea of their taste preferences but also how far I can stretch them so I choose two safe choices and two bold choices. 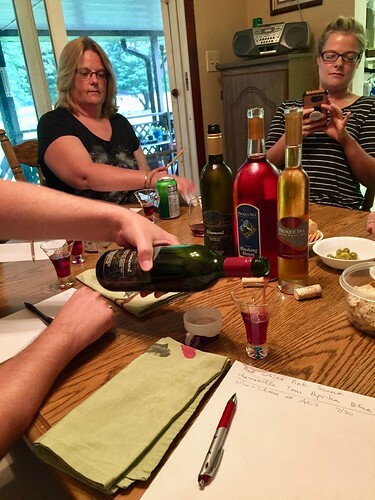 Do you have wine tasting parties with your family and friends? Ours enjoys it so much that some come to expect it now but what better way for us to strengthen our skills and try some wines we might not unless we were all together. Need some pointers on how to put together one of these parties, send us an email. When putting together a tasting with four wines it’s important to figure out which order to put the wines in. Instead of the hard fast rule of white wines before red we created the order by dry first, sweet last and just filled in appropriately with white and red. We began with the Dry Concord, which may seem like an oxymoron but that’s why we needed to include it in our tasting. Neil chose this wine when we were tasting at Penn Shore Winery. He actually chose to buy two bottles of it, one to share and one to drink 😃 There were a few of us that specifically called out that it was “dry” but Diane didn’t find it to be overly dry, she liked it! Michelle and Kathy didn’t find much grape flavor in it but Neil felt it tasted like a fresh grape off the vine. Brian was surprised by the grape tasting more like Niagara than Concord. 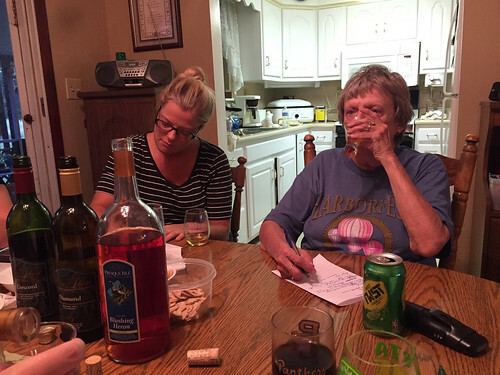 Despite the lack of grape flavor, almost all of us smelled the grapes when we swirled the wine. Gale said it was good and he’d buy it! Some of us felt it was tart, sour or bitter but I don’t think that would prevent any of us from drinking it. 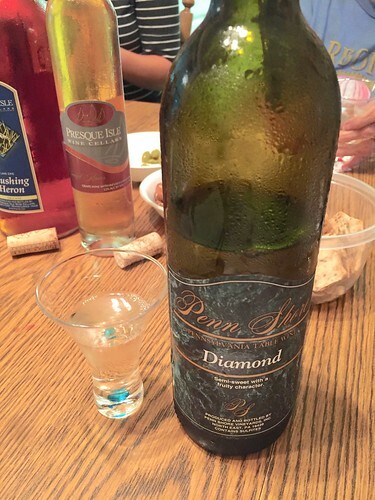 Our next wine was a white wine called Diamond from Penn Shore Winery. Diane chose this wine at the winery because she was blown away how much she liked this white wine. As someone who “rarely wants white wine,” she had to share it with the group. Upon first taste, we all knew this had grape aromas and flavors. The more experienced in the group called out the Niagara and Fredonia blend. Once we all started listing tasting notes it was certainly fruity including tangerine, citrus, mandarin orange, cantaloupe, white grapes, apples and more specifically green apples. There was also mention of oak influence, possibly smoke, a slight texture of bubbles, and a floral finish. Always fun to find a wine with so many notes to record! Diane was certainly happy after her second tasting, she declared this her favorite wine of the evening. Michelle liked it, she said she’d buy it! I was a bit confused by this wine, I think it may have had too much going on for me. Both Brian and Diane described the wine as “dessert wine”, I’d say that is pretty common for this wine region. Every year when we get together with this group we include a wine that is part Concord and part Niagara so we already knew we’d be looking for one to bring to the party. 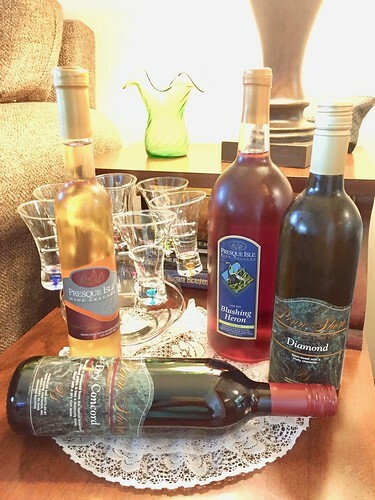 This year we had the Blushing Heron rose from Presque Isle Wine Cellars. Make note of the big bottle, this blend is usually quite a hit with this crowd! This wine ended up having mixed reviews, though. There were a few comments on this wine regarding the wine barrel. Kathy and Neil found it to be musty but Brian thought it smelled sweet and smoky, while Diane and Brian both described it as hickory. Then there was the other part of the group that felt it was floral, with wild fruit aromas but then flavors of koolaid, smarties, sweet tarts, watermelon now and laters, chewable vitamin C and bazooka joe bubble gum. At the final extreme was Michelle who had her tongue go numb from the flavor of antiseptic cleaners. Guess we need to stick with the blends from past years, to please this crowd! 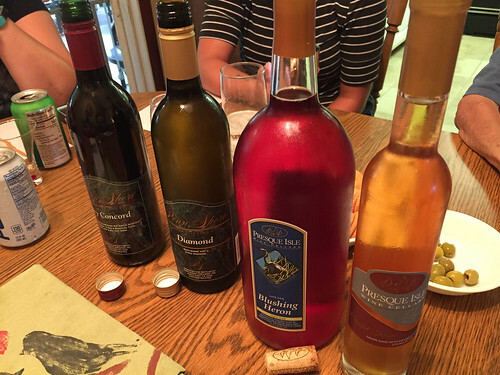 A new addition to this year’s party was an ice wine, Cinnful Kisses from Presque Isle Wine Cellars. Although it might be difficult to split up a 375ml bottle between 7 people, I was willing to give it a try. There was no doubt that this wine smelled, tasted and emitted cinnamon! Brian made note of the peach color and deep rich aroma. Diane thought it reminded her of an apple brandy and Neil thought it was like a tawny port. Other notes that came out were cinnamon toast, apple pie, pie crust, cinnamon spice, coffee cake, cinnamon applesauce and apple pie candle. Half of the group either listed it as their favorite or declared it as something they would purchase but Gale said “He wouldn’t hit a dog in the a** with a bucket full!” Well I guess that leaves 6 of us that enjoyed tasting it. After tasting all four wines, some people had standout favorites or definite No-ways but Brian and I thought all the wines were pretty good. It is a good idea to mention that all these different wines will leave people needing to cleanse their palates, especially with those sweet wines mixed in! Our group enjoyed using olives, crackers, and almonds. They actually ate through almost all of them before we even got to the cheese. We began the cheese portion of the tasting with one of the “safe” cheeses, Camomilla by Reverie Creamery. This is one of the cheeses we heard about during a past trip out to the shop. They offer a few cheeses that are washed using herbal teas, having never tried anything like this, I was happy to pick up a wedge to bring along. After one taste, I knew I wanted to try this cheese on a fried egg sandwich but lets see what everyone else thought of it. Most of the group found it to have mild aromas but Neil and I picked up some funk, as well as flowers and milk aromas. The flavor reminded Brian of fondue and he wondered how it would taste if it were melted? Neil described the flavor as “gentle” with slight chamomile. The rind threw a few people for a loop when they described it as woody but Neil and I noticed the rind to be musty and funky. I guess the group would mainly describe this cheese as something like cheddar or swiss. Maybe it was too safe? Next up was a second cheese made by Reverie Creamery, Tom. 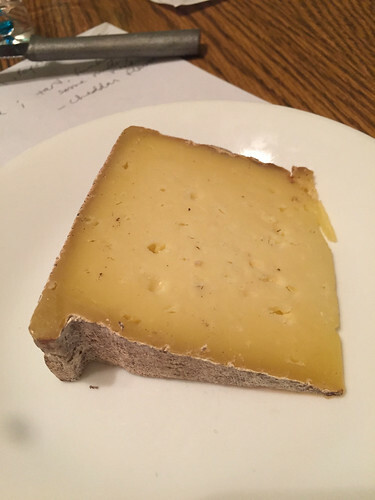 We’ve tasted this cheese with the group before but everyone enjoyed it then so I figured “Let’s bring it back again.” This is an aged cheese with a defined rind and Brian actually took note of the small air pores and mold taste on the rind from it being aged. Speaking of the rind, I could smell the chlorine wash on it but that didn’t turn me off. Michelle thought it had a really strong first bit and a slightly sour milk smell but it wasn’t unpleasant. How would we all describe it? I think bold! 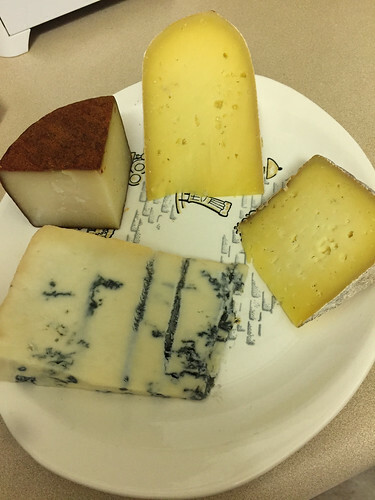 Neil is always pretty descriptive with his notes, “funky, salty and barnyard aromas as well as a little bit of barnyard flavor, light salt, slight pepper, milky funk, straw and yummy.” After everyone took their tasting notes, we had 3 votes for favorite cheese of the night. 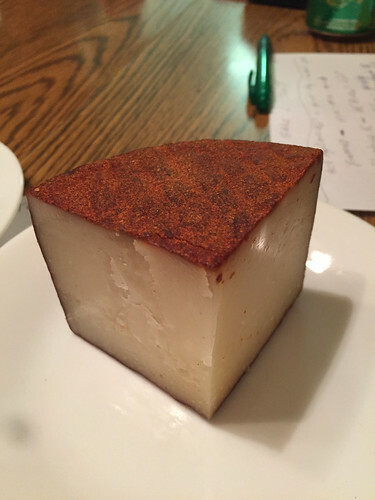 The Alisios, a paprika coated hard cheese moved us into the next section of the “adventurous cheeses”. The paprika made the rind look pretty but according to Diane, it didn’t really make the cheese have a specific smell. Kathy was the only one that really noticed the paprika in the aromas although Brian found it to overpower the flavor. Neil thought there was a nice light paprika flavor and I made note of a flavor of mustard, possibly from the paprika? The question of texture certainly came up with this one; dry, not very smooth, waxy, almost gritty, and crumbly. Maybe this is why people had a hard time with it? Despite the naysayers, Neil and Michelle both liked it. 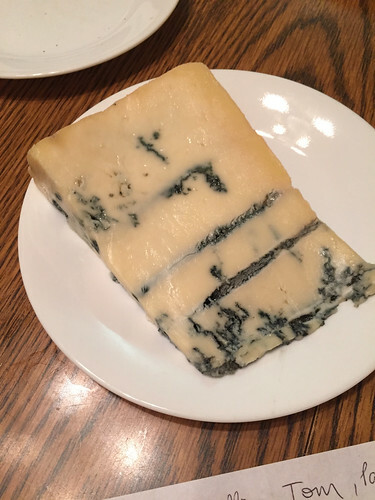 The gorgonzola picante was probably the biggest long shot of the night but many of you know of my deep love for blue cheese, so I had to take the chance. Kathy started by just saying NO! Neil thought it was super funky and the aromas reminded him of a creek in a cave. Brian didn’t like the smell or taste! Diane chimed in that it smelled like Brian’s dirty socks and had an awful taste! The flavor was salty, pungent and spicy with a mouth watering acid. I marked it as one of my favorite cheeses of the evening. Michelle didn’t like it but I think she held out the longest describing it as very funky, moldy, smelly, strong and the rind was crunchy. She did say it made her tongue numb but was a champ for staying in to give us that many notes! Neil liked that it made his tongue numb, maybe that was the picante side of it? It did have a strong flavor and he wondered if it might be the penicillin inside giving it a slight medicinal bitterness? Either way, we were both happy to continue eating it as everyone else cleansed their palate with almonds and crackers. One of the fun parts about having a wine and cheese party is that although everyone will find their favorites, they are usually still game to try everything. That brings us to the wine and cheese pairings. This part is always much less official as far as notes go but everyone usually tries at least one pairing. I’ve gotten smarter as the years go by and just hand everyone a piece of note paper at the beginning of the night to help keep track of everything, especially who paired what at the end of the night. It seems Diamond was a pretty popular because it was paired with every cheese of the evening! With the gorgonzola picante, I found the wine to get more sugary and the cheese to get creamy and salty. It was a pretty good pairing. Michelle and I both paired it with the Tom, which caused the wine to get sweet, fruity, tart and smooth. 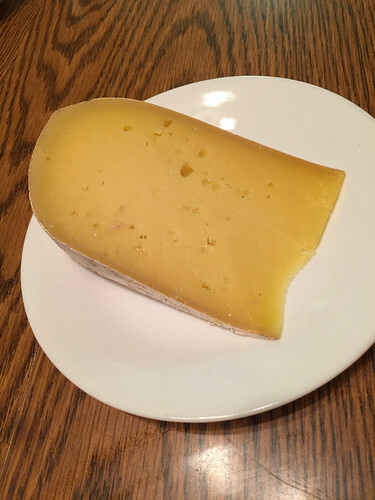 We both agreed that the cheese got funkier, as well as creamy, a little sweeter, and smooth. Another good pairing. The pairing of Diamond with Chamomilla, was a good pairing for Diane and Michelle, although Michelle thought the cheese had a little less flavor. Neil joined in on pairing the Diamond with the Alisios which caused the cheese to become more round with a little salt. Great job team, pairing the wine with all cheeses! It seemed like a good pairing all around! Neil lead us in pairing the Dry Concord with the Chamomilla. The cheese stayed the same but the wine became stronger and more cherry. I went along with him and also did the pairing. This one didn’t work out so well for me, the wine became more bubble gum flavored and the cheese was milky but the rind lost it’s flavor. I know there were pretty mixed reviews on the Blushing Heron so I decided to do the pairing with the Alisios so that we could have at least one cheese with this wine. The wine smelled like koolaid but had flavors and aromas of flowers. The cheese smelled salty, and tasted crunchy milky and smoky. It redeemed the cheese for me and was another good pairing. 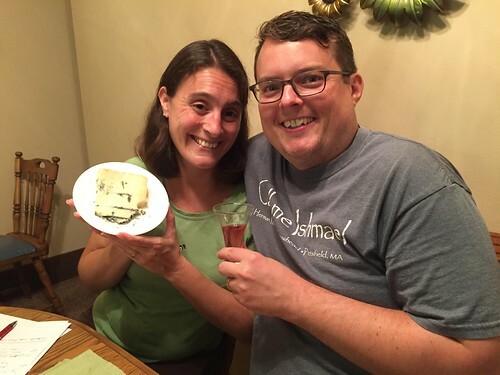 The final wine to pair with the cheeses was the Cinnful Kisses ice wine. Nobody chose to pair it with the Chamomilla but the other three cheeses were used. As you may have guessed, Neil and I both paired it with the gorgonzola picante. Sweet and Strong, that’s how you pair with wine and cheese, right? We knew, they both balanced each other well and you could still taste both individually. Neil thought it was bitter and sweet, sweet and then super funky, a “Super yummy pairing,” if you ask him! Michelle didn’t like how the wine and cheese changed each other when she paired it with the Tom. The cheese was funkier and the cinnamon taste disappeared. Michelle continued by pairing the wine with the Alisios and found a better match. The wine had less of an apple taste and her tongue was numb but she said they were very good together. I think most of our pairings came out as “good pairings”! That’s pretty exciting considering people were back and forth on both the wines and the cheeses individually. Another gold star for Wine And Cheese Friday. And thanks to all my guest tasters for the evening! All that tasting is fun but also hard work when you have all those wines and cheeses to take notes on. So what do you think, will you stretch your boundaries on your next wine or cheese? 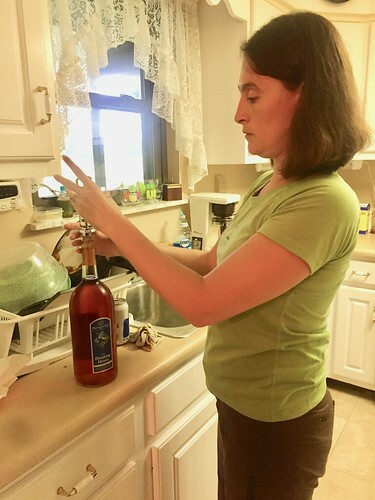 Kathy ended the evening by adding some lemon lime soda to her Dry Concord, so it’s possible to make the wines you’re not sure about into something you’ll enjoy. Why not try a cheese that’s a little past your comfort zone this Sunday on Cheeselover’s Day?